Sedona is a luxury destination, known for fine dining, 5-star resorts, indulgent spas and spectacular scenery. But Sedona is also perfect for those on a budget. Why? Many of the best things to do are totally free, like taking photographs of the sunset at the Airport Mesa vortex, driving the Red Rocks Scenic Byway and hiking trails with drop-dead gorgeous views. I think it’s impossible to take a bad photo in Sedona, Arizona. The scenery is that beautiful. In fact, there were a few times during my solo road trip that I thought I might drive right off the road because something appeared in front of me that was just knock your socks off gorgeous! 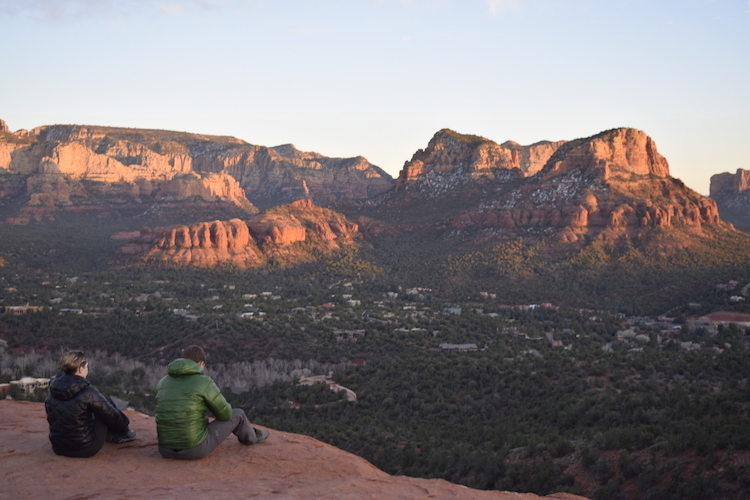 One of the best free things to do in Sedona is to head out with your camera as sunset approaches. The red rocks really come alive at magic hour, including iconic formations like Cathedral Rock, Courthouse Butte and Coffee Pot Rock. Just be aware that popular spots, like the Airport Mesa vortex off Airport Road, have small parking lots that fill up quickly. Get there at least an hour before sunset; a picnic will help you pass the time. 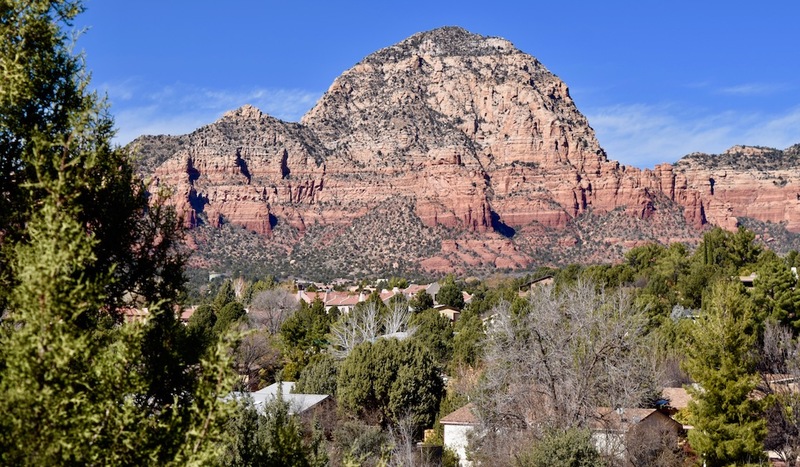 TravelingMom Tip: Many popular trailheads in Sedona require a Red Rock Pass for parking, but the ones along SR 179 do not. Win! At one of the northern roundabouts on the Red Rock Scenic Byway is a sign for the Chapel of the Holy Cross. You’ll want to take a few minutes to detour for a visit. 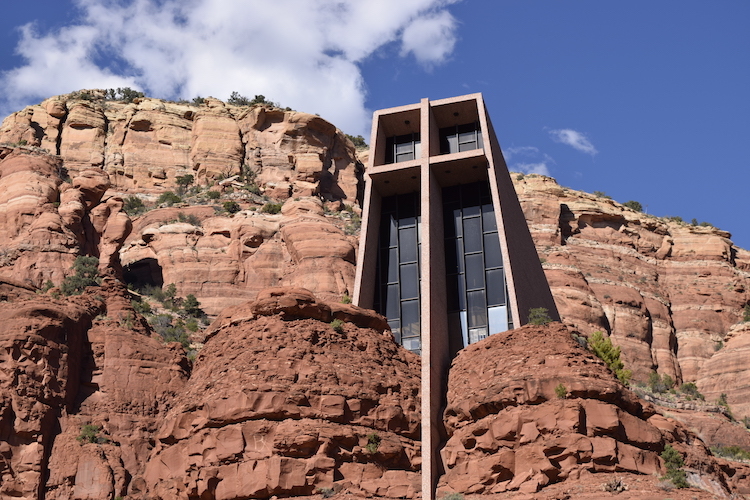 Built in 1956, the Chapel is set into the Sedona canyon walls. It’s an engineered marvel that seems perfectly in tune with the natural setting. There are several small parking areas along the steep access road. A volunteer in a golf cart was there when I visited to guide guests to parking spots and to shuttle people from their cars to the Chapel. 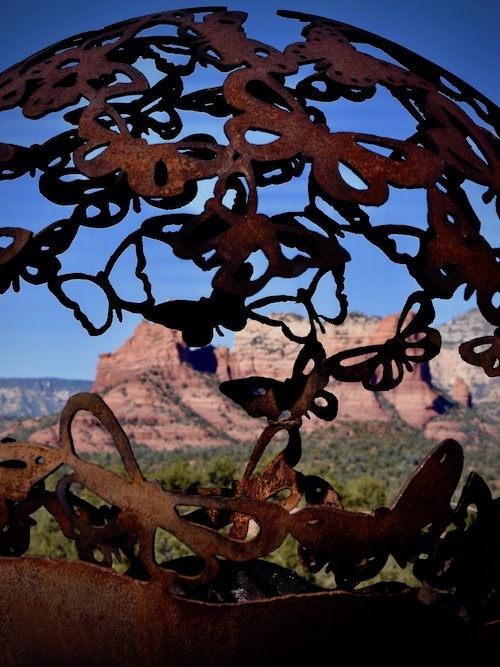 Several tour companies, including Sedona’s popular Pink Jeep Tours, include a stop at the Chapel on their excursions too. No matter your religion, the simple interior of the structure is a quiet place for contemplation and the view of Bell Rock is one of the best. So it’s definitely worth it to make the climb to the top. What’s a Stupa? I’m still not sure I really know, but I’m glad I visited during my trip to Sedona. 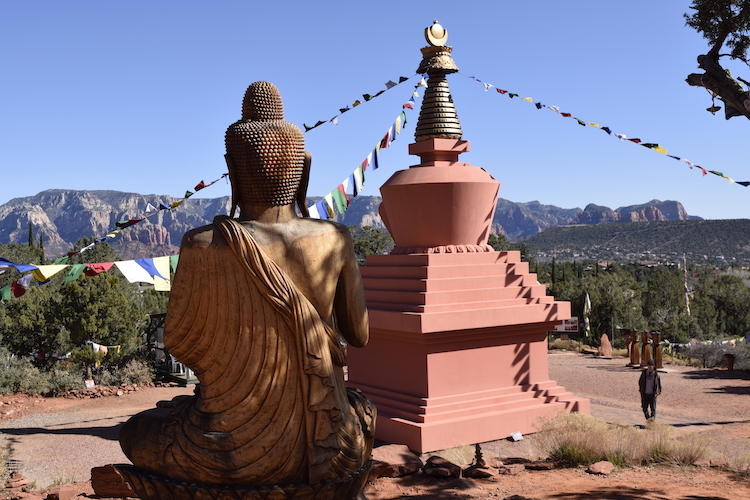 The 14-acre Peace Park is located off of SR 89A in downtown Sedona. A meandering trail, lined with trees adorned with prayer flags, leads to the Stupa, a 36-foot tall Buddhist structure. Visitors are invited to walk around the Stupa 3 times in a clockwise direction, while keeping an intention in mind. Even if you choose not to participate in the ritual, take a moment to sit in one of the chairs located around the Stupa. It’s a wonderful opportunity, during a busy vacation, to reflect for a moment on the beauty surrounding the park. Several people told me that the park attracts wildlife, especially near dusk. If you time it right, maybe you’ll run into a flock of Arizona Mountain bluebirds or one of the local wild pigs, called javelinas. I couldn’t believe it when one crossed in front of me! Strolling through the Spanish-style courtyards in the Tlaquepaque Arts and Crafts Village is a pleasant way to spend a Sedona afternoon. Featuring many galleries, shops and restaurants, Tlaquepaque (pronounced Tuh-lah-kee-pah-kee) also has a full calendar of activities making it a popular destination for both residents and visitors. The drawback? The price tags can be staggering and I was disappointed to discover that some of the goods I was interested in were not made in the area. Finding locally made souvenirs is important to me. 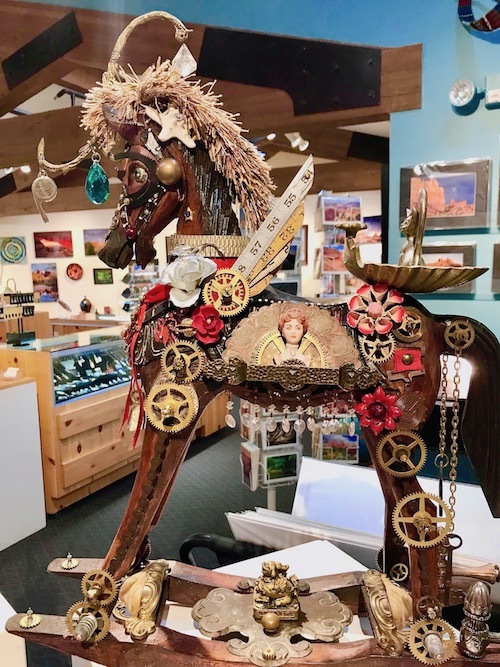 So, while I enjoyed seeing Tlaquepaque (and eating an amazing shrimp chimichanga at El Rincon), I was glad I also stopped at the Sedona Arts Center in Uptown Sedona. 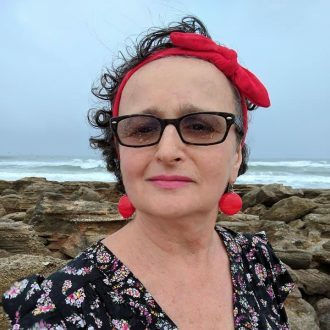 Featuring the work of local artists, the gallery has a wide range of items for sale and, since the Center is a 501(c)3 not-for-profit, you don’t have to pay sales tax. I was able to find some gorgeous beaded and bronze earrings for my daughters that didn’t break the bank! Hiking is what people do in Sedona and I’m sure it has something to do with the super year-round weather and amazing landscape. At home in New York, I have to make an effort to locate trailheads. But not in Sedona. Trailheads are everywhere, even in many housing developments. And you don’t need to commit hours to a hike; I found that a 10-minute walk can easily get you from a parking lot to an amazing view. For example, if you’re heading north on SR 89A, take a left onto Soldier’s Pass and follow it to the trailhead. Within minutes, you’re standing at the edge of the Devil’s Kitchen Sinkhole – just be careful! Hiking is an activity for all ages. If you’re traveling with little ones, make a pit stop at Sunset Park. Besides a wonderful playground and splash park, it features the very cute Lollipop Trail, a 1/10th of a mile loop. So even the tiniest hiker can say they hiked Sedona! TravelingMom Tip: Remember, the Arizona sun is strong. Water, sunscreen, sunglasses and a hat help to protect. And don’t forget water; the air in Sedona is very dry and it is amazingly easy to get dehydrated. The Sedona Visitor’s Center is located off of SR 89A in Uptown Sedona. It is staffed with friendly folks who can help you decide what to do during your stay. 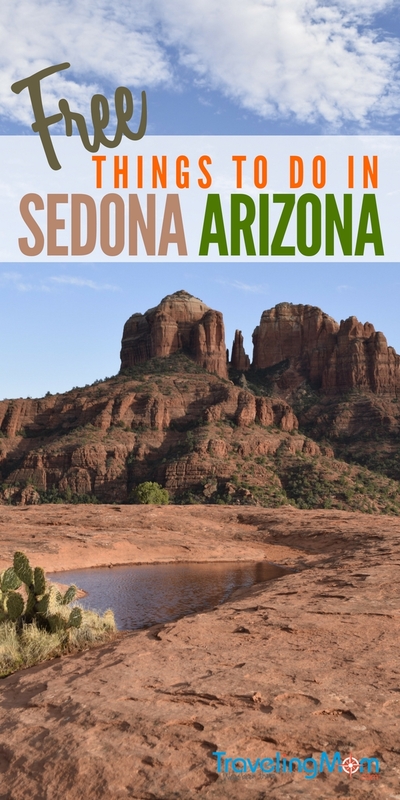 Check out area maps and pick up brochures for local attractions, like the Sedona Trolley. Don’t forget to take a copy of the Visitor’s Guide newspaper – it has current event information and a handy trail map. 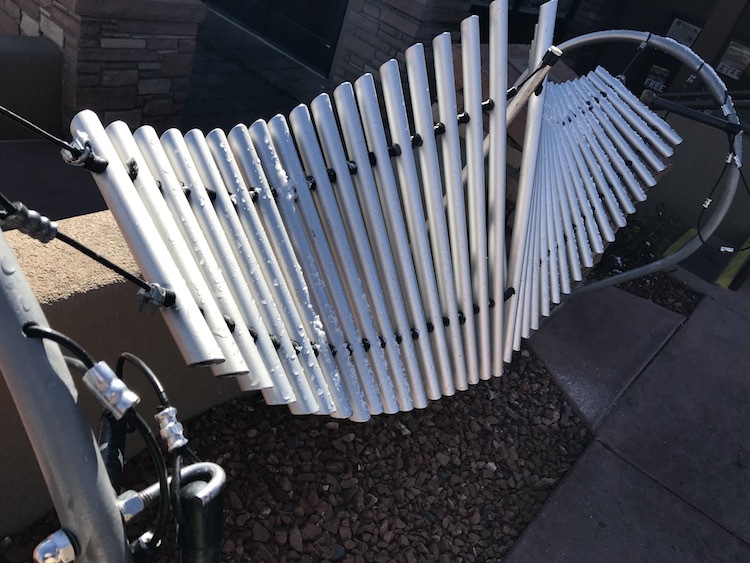 A collection of grand chime instruments called the Free Notes Harmony Park is located in a courtyard outside the Visitor’s Center. If you’re traveling with little ones, they’ll appreciate the opportunity to let loose and bang a gong. Heck. I’m a grown-up (sort of) and I got a kick out of it. It’s hard to compete with the Sedona scenery, but my loaner car, a 2018 Toyota C-HR attracted plenty of attention. A compact crossover, the C-HR had plenty of room for my solo road trip. The one I drove featured a zippy two-tone paint combo of radiant green mica and a white roof. I got so many “nice car” comments; it seemed to me that no one could look at the car without smiling. Standard on every C-HR is Toyota’s Safety Sense features including dynamic cruise control. That was a big help as driving conditions changed on my trip from rush hour traffic on the highways outside of Phoenix to the open roads around Sedona. Another feature I really appreciated was how simple it was to connect my phone to the car via Bluetooth. Within seconds, I was synced and on a conference call. The sound quality was very good for both phone calls and streaming music via Spotify. I hopped into the backseat to check out passenger legroom. With the driver seat set back to fit 5’7″ me, there was still legroom for someone my size. The backseat does feel a little dark; the rear side windows are smaller than I prefer for light and visibility. The trunk space is what you’d expect for a sporty SUV; my trip was solo, but my guess is that there’s plenty of room for suitcases and carryons for two or a week’s worth of grocery bags for a small family. 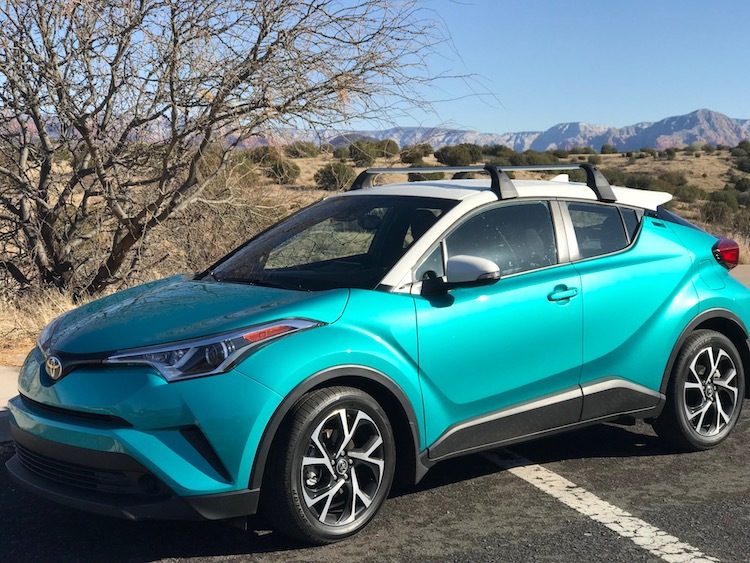 I drove the XLE model C-HR, with a MSRP of $22,500. In my opinion, the exterior styling, with sharp, diamond-like facets and sporty rims, gave the car the look of a luxury sports car. And it handled well in a variety of conditions. A winter snow squall blew in unexpectedly and I didn’t experience any slipping in the wet conditions. I also took it for a spin on a drive up Cleopatra Hill outside Sedona. It climbed to the 5,000 foot elevation smoothly without straining. The Toyota C-HR attracts lots of attention. So, if you’re the shy type, this might not be the car for you. For me, traveling solo, it was a great conversation starter. 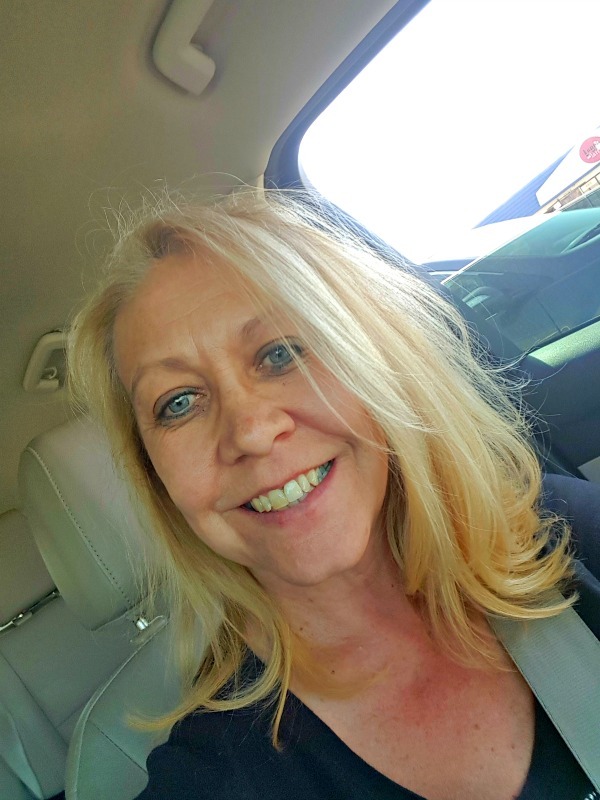 Chats with strangers that started with “Love your car,” ended with great restaurant picks and recommendations for fun free things to do in Sedona! 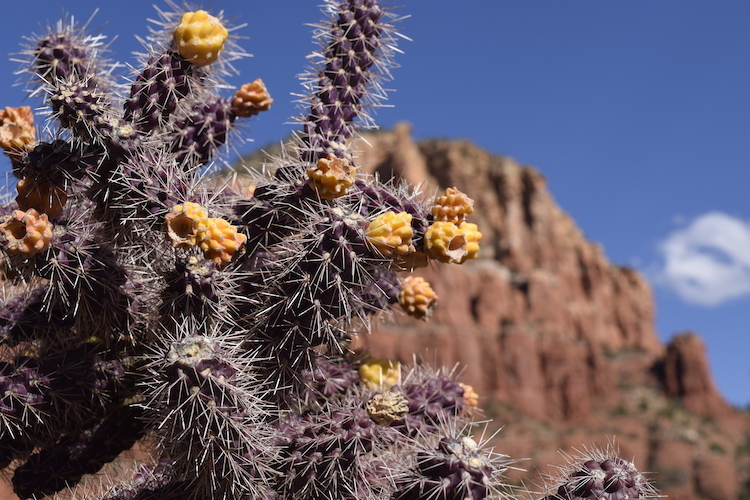 Want to know more about traveling to Sedona, Arizona? 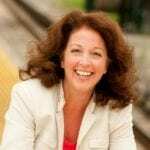 Check out TravelingMom articles about Traveling to Sedona on a Budget and Visiting Sedona with Kids. If you’ve visited Sedona, share your favorite thing to do! My first and only visit to Sedona was more than 10 years ago, riding my Harley. Loved it! Time to return. Great tips. I love red country! I would come back to Sedona in a heartbeat. Check with me before you go next on a solo tip like that. Judging by this post, I would have no problem accepting your itinerary. Thanks for the ideas. I am headed there soon.